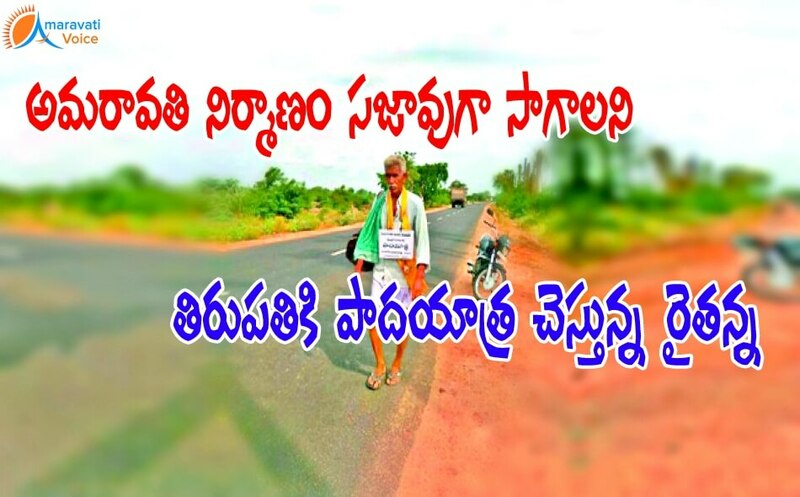 Seeking the smooth construction of Amaravati without any hurdles, B. Subba Rao, aged 74 years from A. Kondur village in Koduru mandal of Krishna district is doing Padayatra from Uddandarayunipalem to Tirupati. He has started the walkathon on Tuesday and he is expected to reach Tirupati on May 27th. He would walk 35 KM every day and halt in the nights, in the near by villages. Mr.Subba Rao said, he praised Chief Minister Chandrababu Naidu and said he has done a good thing to the farmers of Amaravati by land pooling scheme. He praised Naidu for his hard work, towards the development of the state. Mr.Subba Rao said, to support the chief minister, he has decided to conduct a padayatra, so that Amaravati will not have any hurdles. He has already done padayatra from A Kondur to Uddandarayunipalem before Amaravati foundation ceremony.